West of the Hall of Heavenly Kings on the northern shore of the Beihai Lake stands the Nine-Dragon Wall, which used to be the screen wall of a building complex. The wall is 6.9 meters high, 25.52 meters long, and 1.42 meters thick, and covered entirely with glazed tiles. 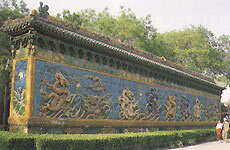 On either side of the wall is embedded with nine dragons in gay color and lively images, tumbling in the midst of clouds and water.